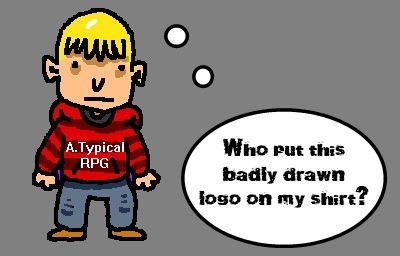 Pre-order the A.Typical RPG now! Feb 22, 2010 – it was a blog post nobody read. Nobody thought that it was the start of a phenomenon. Almost a year later – here’s another blog post nobody will read! And I don’t know what happened to the phenomenon. Preoder the game on Desura! The normal edition gets you the game, while the Extra Cheese With Lighting Bolts Edition gets you the game, along with deleted scenes, extra dialogue and special bonuses from the team! In case you are still not sure about giving us money, why not download the demo from Filefront or IndieDB ? You can view all updates about the game here. The Demo Saga – Part 1 Released! After lots of suffering, pain, tears and suffering, we are proud to announce that the first part of the A.Typical RPG Demo saga has been released! I’ll stop the torture of the gingerbread people now – they have worked kind of hard. We have some very monumental news for you today.It’s the release of the first A.Typical RPG demo! This short demo features a short look at the gameplay of the A.Typical RPG, and features completely different dialog exclusive to the demo! This short demo is the beginning of the demo saga, the (sort of) prequel to the game! We will be announcing pre-orders shortly, so keep your ears to the ground and your eyes near your binoculars for upcoming news! Gameplay trailer and website launch! Oh yeah, I just got my pizza delivered! Now where was I? Right, The new A.Typical RPG gameplay trailer, obviously. Let me rephrase that particular statement to emphasize its colossal importance. A.Typical RPG Gameplay Sneak Peek Released! Expect a big announcement about a demo and pre-orders soon! Plus, I also have a bit of a bad news – our initial estimate of a March 1 release date was very optimistic, which I am afraid we won’t be able to meet. We’ll keep you posted on this. We are a small indie team, and we would rather release late than release incomplete. Hope you understand. I’ll let you enjoy the video now, visit the rest of the site to find out more about the game. I’m leaving for now, my pizza’s getting cold. P.S. We just launched our website too! P.P.S. You’re reading it right now. Call for graphic and website designers! Firstly, we found something strange on the walls of somebody’s office. Could it be – a boss battle? Who knows? Now to business. After ninety six updates, shooting lighting bolts from our eyes and getting kicked around the earth for your pleasure – we decided enough was enough. We decided to make people pay for their crimes against humanity. But before we set out on our epic quest, we found that we were lacking something. He’s been on a roll, and has drawn quite a lot of new stuff. More pretty things in the future! I hope he draws a unicorn next. Unicorns are SO AWESOME! Moving on, here’s a new situation that we have been iterating on for quite some time. How to talk to people and RELEASE DATE! First things first (as it should be, after all when are first things second? or third?) – we plan to release the A.Typical RPG on March 1, 2011! If you feared the game would be in the constant limbo of development – your fears may not be vanquished yet, but now you have a date to mark on your calendars. That can only be good! Moving on, we reveal one more key element of the game – conversations. To elaborate, let’s have a chat with this in-game element to see how they roll. Me: So, tell us a bit more about yourself, Mr.… ? ??? : I’m the conversation system used in key moments in the A.Typical RPG. But you can call me Dan. Or wait, Poseidon is better. Call me Poseidon. Me: I’m going to go with Dan. So Dan, what do you do? In the programming front, I have sadly been delayed by exams and the demise of a very close friend of mine. However, I have been working on a brand new conversation system for the game, to be used whenever the pressure is high and important stuff is at stake. That warrants it’s own separate post (and I don’t want to inflict programmer art on you guys when we have much prettier stuff to show). Stay tuned! 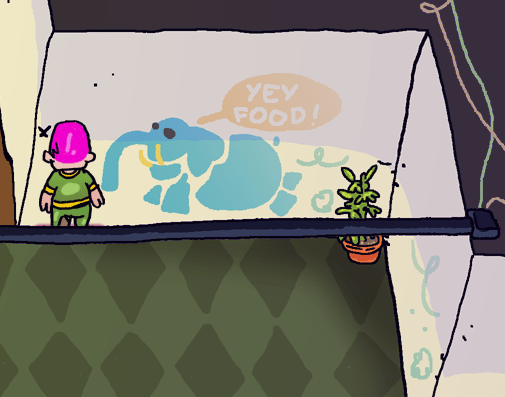 And our super cool artist Henri continues to dazzle me with a pretty and surreal new level. What could it be? Take a look and maybe you can figure it out! Hint : Look at the heading. And last but not the least, Jesse, our new music emperor™ has composed not just one, but 3 new tracks! I won’t spoil all of them right now, but here’s a sneak peek at some *gasp* gameplay and music simultaneously! Vote for us in the Indie of the Year Top 100! Follow us at these cyber places for more news! How do we describe something in only sound? First we close our eyes. What do see when these sounds are heard? Music and sound help us get places emotionally that pictures alone can not. It is together that the full impact can be felt. I’ve always mixed music with the lights out. When I listen to mixes back it’s with my eyes closed. Writing a piece that reflects a sense of place for me starts with my eyes open. The world map screen music was something I came up with based on several things. Arvind’s direction (over all temperament of the piece) , the visual mood of the screen, and the over all story of this character. In regard to the composition and how it relates in context of the game. There are lots of choices to be made here, many bad and many good. A feeling of mystery with an underlying sense of adventure and child like exploration was also something I wanted to portray. Music in games that is played over and over again is often loops of small sections so you always have to be thinking how to you make this interesting without being repetitive and cluing the listener in that this is in fact a loop. Typically I will try to cover at least two different melodic perspectives to induce movement and progression into small sections like this. The basic chords started on guitar, was later moved to piano and then the strings where added. The sliding guitar melody heard throughout was added last and is supposed to represent the main character. This is the basic approach I use for each scene or screen through out the game itself. Sometimes things come quickly to me and others there is more concrete thought involved and less gut. Much like a dream is something less driven by yourself, when you are in that place of creation the feeling is that of a passenger. I find it a little hard to describe my method to someone. I nearly I always find that other musicians and writers understand that sense of creation that is less easy to describe than it is to simply show. Vote for us in the Indie of the Year awards! Follow us in these cyber-places too! My time to post something here. Arvind wanted a graphics-related article out of me, so I’ll empty my heart here then. For me, the difference between an average JRPG -clearly our influence- and A.Typical RPG is that, as a comic artist by nature, my natural approach to graphics is this flowy (or shakey) lineart and bold colors. Everything is done in free form, without a locked 32×32 pixel grid, where you plant cloned trees and grass stumps. These visuals are closer to a point´n´click adventure game (those I love), with less areas to visit, but each having its own history and logic, and its own unique moment in the narrative. I’m not exactly sure which way would’ve been faster, mimicking a tile-look or throwing this in free form, but ultimately, I felt like this is something I am more comfortable with, and I can actually pull off doing 10 different settings and tons of characters like this. Its way easier to finish a gargantuan task that you´re comfortable doing, than a small task that you´re not so comfortable with, pretty much. Same I apply for any illustration that I have to work on. As in, non-game things. Leon_Kilean: I’ll just go along what you’ve sketched. So that’s pretty much how it starts. We use Dropbox to share our files. Its just the right program for us, since I can just edit some graphics-file (we use .png, mostly) and it automatically updates at Arvind´s end. He comments on it, I add something. So, lets open up the girl´s dorm sketch. I tend to add some empty space around the levels, something that Arvind doesn’t add much of, since he works purely from the code/gameplay side. For me, empty represents time for the player to walk around and discover things, arty farty nonsense areas. Sink in. But this one I wanted to keep intact, for two reasons. First being, its very closely tied to a certain gameplay-event, so I cant just add and reshape the areas without breaking that. Second, I found something interesting in the shape as it is. A Small room, a single screen, sorta claustrophobic. It serves as both a intimate space, story-wise, and a gameplay-related tense moment, which I mentioned earlier, but wont spoil any further. The first thing I work out is the walls and the floor. Strong green for the walls, dark red on the floor. There´s a tricky part on the right top. The bathroom. Vertical walls are ok, but horizontal walls that are in the middle of the screen space are pretty tricky, since the player should be able to move both in front and behind these, and he should ALWAYS see what he is doing. As I said, the bathroom was tricky. What I chose to do is, paint the horizontal wall you can go behind as cracked. Either it really IS broken like that, or its just for the player.. Use your imagination. The blue rugs in the bathroom are very important, since they imply that there´s a doorway/some empty space you can walk thru. Then, the flowers I cloned, all light effects and shadings are on their own layers, props and things are on their own layers.. or in their own groups. Group folders are so cool, learn those. The cool thing with grouped layers is, you can have stuff like a master alpha channel for the whole group, and it affects all the layers inside the group. So basically, I drew the broken wall as totally opaque, with the flowers and whatever detail layers it has, and THEN added an alpha mask on the WHOLE group, the wall and its goodies, and made the GROUP transparent. Easier to edit the stuff like that. I always try to keep my files as dynamic as possible, especially important with games, since there usually are plenty of changes. I rest for a day or two, clear my brains a bit. And then I spend a good 3ish hours on finishing the level up. Notice that I painted some posters on the transparent, broken wall. I didn’t have to edit any alpha channel settings, I can just add new layers into my broken wall-group and they´re automatically affected by the master alpha channel, which gives it that translucent look. No hassle, all is automatic. Sweet Photoshop, how I love you. A.Typical RPG´s level graphics are actually on two planes. There´s the ground plane, and then there´s an overlay, that draws on top of the player. So I separate all the light and shading effects, and things that are on top of the player, and make an own file out of those. –Before I shoot myself. Nah kidding. But I just had such an dramatic sub-title. Okey so I hope we’ve all learned something out of this, or if not, at least entertained ourselves for a few mins. Do keep watching/following/worshipping us, oh and feedback and comments – we love that stuff, keep it coming!